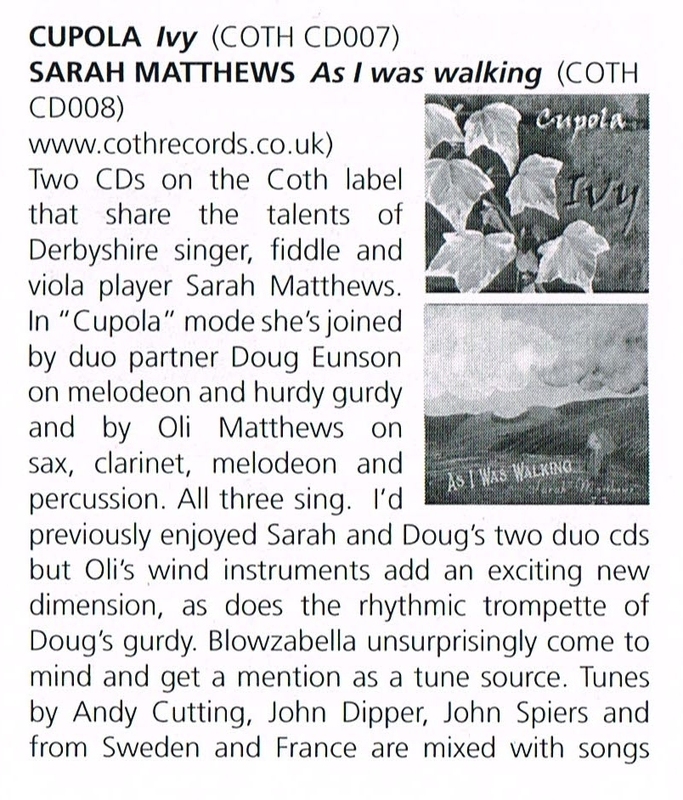 Sarah Matthews, who has twice performed at the Poppy Folk Club as part of the band Cupola, has recently set off in a new direction as a solo artist, and we were delighted when she agreed to start our evening concert with a 30 minute set of tunes and songs from her solo repertoire. 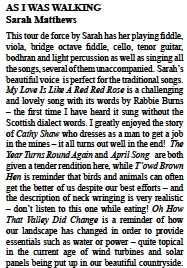 She is a delightful singer and musician, and got the concert off in style with some of her own songs, like the excellent song ‘Oh How that Valley did Change’ from the Mills & Chimneys project; and songs from the writings of Maddy Prior (Bewcastle Fell), Robert Burns (Red Red Rose) and Gerald Short (T’owd Brahn ‘En). 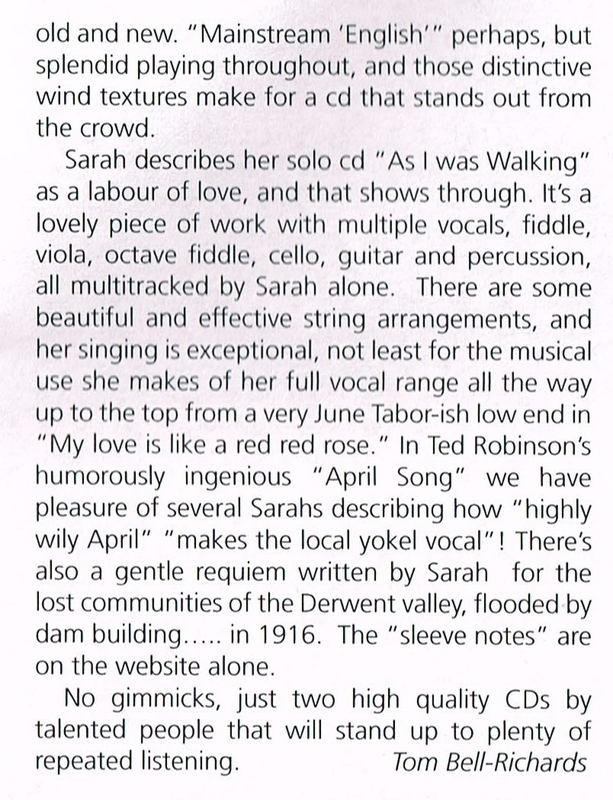 Sarah Matthews has produced a cracking first solo CD with As I Was Walking, but this should not be a surprise for anyone who knows her. It is not only her fantastic playing but also the attention to detail which makes this so good, and the fact that this is truly a solo album. Everything you hear is Sarah herself, with no ‘special guests’ to support her or indeed for her to hide behind. It’s a journey that started many years ago and has included a number of collaborations; as a member of various groups including the Rattlers and the excellent Cross O’th Hands, as well as projects such as The Mills and Chimneys and The War Horse Folk Music School to name but a few. The material has a strong Derbyshire feel but cannot be described as parochial. She adds something new to all the familiar songs such as My Love Is Like A Red Red Rose and her wonderful version of Joni Mitchell’s The Fiddle And The Drum. 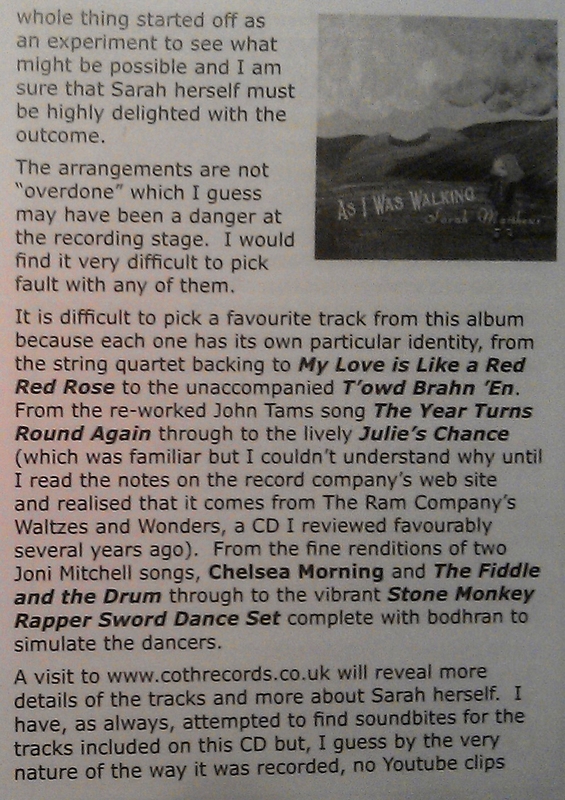 A real revelation though is her self-penned, unaccompanied ballad – Ballad Of John Bright – a real highlight for me. Mention must be made of the excellent mixing and engineering by Doug Eunson, who also has a hand with Sarah in the production. 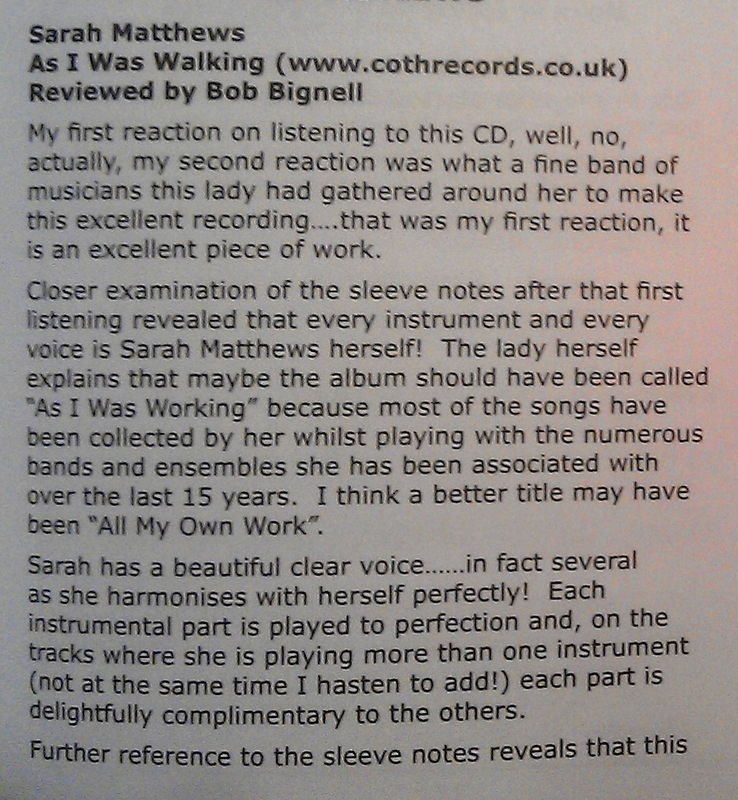 If you are not familiar with Sarah’s previous work I suggest you have a real good listen this CD before working through some of her other work, including Cupola (details of which can be found on her informative website). A mature offering from one of our hardest working musicians.